Cuts and Scratches: Surface cuts or scratches that only go partially through the skin. They rarely get infected. Deep cuts, called lacerations, go through the skin. Scrapes: An area of surface skin that has been scraped off. This often happens to the knees, elbows, and palms. Bruises: These result from a direct blow or a crushing injury. There is bleeding into the skin from damaged blood vessels. There is no cut or scrape. Cut - Shallow: shallow cuts (scratches) only go part way through the skin. They rarely become infected. A scratch is an injury to the skin by a sharp edge. 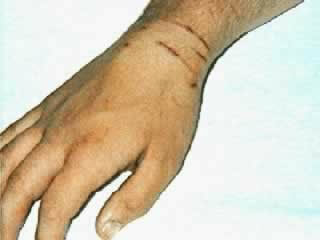 For example, scratches can be caused by fingernails, a sharp nail, a piece of metal, or a branch of a tree or bush. A paper cut is a scratch from the edge of a piece of paper. A shallow cut or scratch can usually be treated at home. Making sure the wound is clean is the most important thing. Cut - Deep: deep cuts (lacerations) go through the skin. 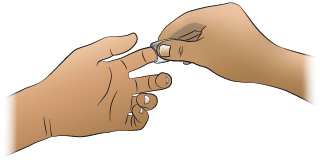 A laceration is caused by cutting the skin with the sharp edge of an object. This can happen from a knife, a razor, a piece of glass, or the sharp edge of a piece of metal. Making sure the wound is clean is very important. Stitches may be needed. 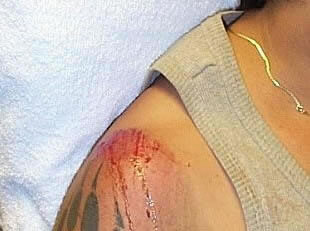 Scrape: this happens when an injury scrapes off the top layer of the skin. 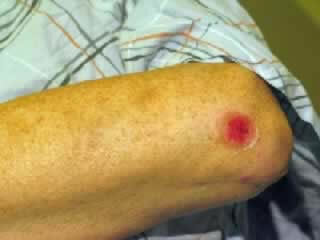 Examples are when people "scrape" their elbow or "skin" their knee. 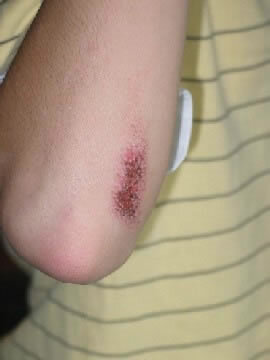 A rug burn is a type of scrape. Abrasion is the medical term for a scrape. Pain and bleeding are usually mild. 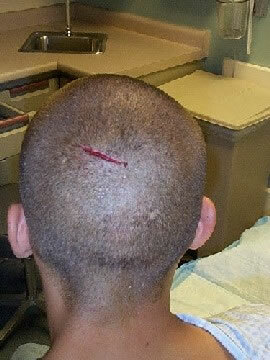 A scrape can usually be treated at home. Making sure the wound is clean is the most important thing. Any cut that is split open or gaping most likely needs stitches. Cuts longer than ½ inch (12 mm) most often need stitches. 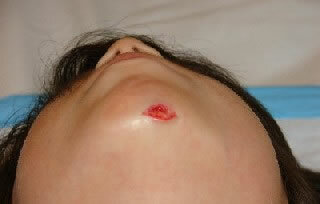 On the face, cuts longer than ¼ inch (6 mm) most often need stitches. A doctor should look at any open wound that may need stitches. A doctor should be seen regardless of the time passed since the injury. When Can Liquid Skin Bandage Be Used? Liquid skin bandage can be used for small shallow cuts. It can also be used on scratches and scrapes. Liquid skin bandage has many benefits when compared to a regular bandage. It only needs to be put on minor cuts and scrapes once. It helps stop minor bleeding. Liquid skin bandage seals the wound and may help it to heal faster. It also lowers infection rates. However, liquid skin bandage costs more than adhesive bandages (Band-Aids). 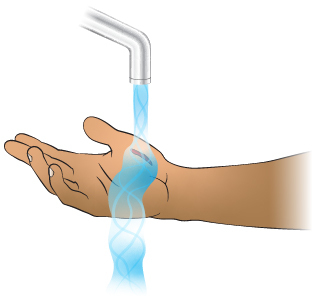 Instructions: after the wound is washed and dried, spray or swab on the liquid. It dries in less than 1 minute and most often lasts a week. You can bathe as normal. Examples: Band-Aid Liquid Bandage, New Skin, Curad Spray Bandage, and 3M No Sting Liquid Bandage Spray. It is a rare infection caused by bacteria found in places like dirt and soil. These bacteria enter through a break in the skin. They then spread through the body. Tetanus is often called "lock jaw." This infection causes very serious symptoms such as trouble breathing and severe muscle spasms. Even with treatment in a hospital, a person can die from tetanus. A tetanus shot protects a person from getting tetanus. It can also protect a person from other kinds of infections. When Does an Adult Need a Tetanus Shot? Clean Cuts and Scrapes: tetanus shot needed every 10 years. People with clean minor wounds need a tetanus booster if their last booster shot was more than 10 years ago. Minor wounds include a surface scrape or a cut that occurs while washing dishes. If it is more than 10 years since last tetanus shot, get one in the next 72 hours (3 days). Dirty Cuts and Scrapes: tetanus shot needed every 5 years. People with dirty wounds need a tetanus booster if it has been more than 5 years since their last booster shot. Dirty wounds include those contaminated with soil, stool, and saliva. They also include more serious wounds from deep punctures, crushing, and burns. If is more than 5 years since last tetanus shot, get one in the next 72 hours (3 days). When in doubt, assume that the wound is dirty. Cuts and scrapes are types of skin wounds. 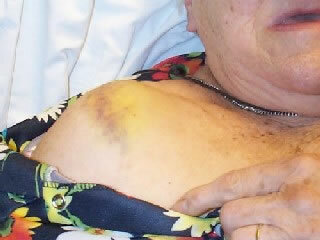 Bruises are the result of injuries that cause blood vessels to leak without breaking the skin. Cuts and scrapes can become infected, so need to be taken care of. You can treat minor skin injuries at home. Use direct pressure for 10 minutes to stop any bleeding. Cut off any pieces of dead loose skin using small sharp scissors. Clean the scissors with rubbing alcohol before and after use. Put on an antibiotic ointment, covered by an adhesive bandage (Band-Aid) or dressing. Change daily. Another option is to use a liquid skin bandage. This only needs to be put on once. Avoid using ointments with this. Cold Pack: For pain or swelling, use a cold pack or ice wrapped in a wet cloth. Put it on the sore area for 20 minutes. Repeat 4 times on the first day, then as needed. If pain lasts over 2 days, apply heat to the sore area. Use a heat pack, heating pad or warm wet washcloth. Do this for 10 minutes, then as needed. For widespread stiffness, take a hot bath or hot shower instead. Move the sore area under the warm water. Rest the injured part as much as you can for 48 hours. What to Expect: Pain and swelling most often get better 2 to 3 days after an injury. Swelling is most often gone in 7 days. Pain may take 2 weeks to go away. This 74 year old female did not recall hurting her hand. She takes the blood thinner Coumadin. 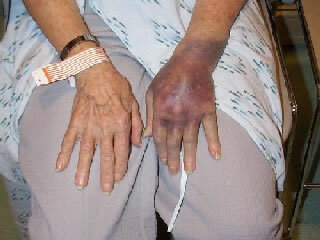 The picture shows a large amount of bruising (ecchymosis) of the left hand. There is no broken bone (fracture). This bruise is four days old. This individual fell and scraped his shoulder on the sidewalk. 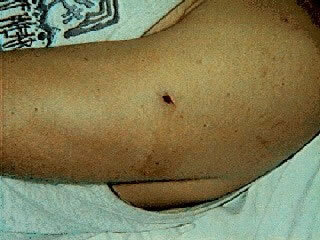 The picture shows a shallow abrasion with minor bleeding. Apply an antibiotic ointment, covered by a gauze dressing. Change daily.